The performance of a nutrient solution is not guaranteed by simply using a quality brand. Proper dosing procedures and ongoing maintenance are necessary to obtain maximum performance. 1. Always use a professional liquid nutrient, ideally one formulated specifically for use with the medium being used. Be sure to use the associated additives as overall performance will often depend on these. The order in which you add different components is important, and so is the timing—seedling, vegetative or bloom. ALWAYS follow the dosage chart! 2. Use clean and sterile water. This helps to prevent diseases. Use either fresh reverse osmosis water (ideal due to its low nuisance salt content) or fresh treated tap water. 3. Add nutrients and additives to water: Always add the majority of water before adding nutrients and additives. Never mix any nutrients or additives together in their concentrated form. Once a nutrient or additive is added to the water, stir well before adding the next. High pH additives should be added last, pre-diluted into a cup of water before being added, quickly stirred and the pH checked (Fig 13.1a). pH: Maintain between 5.0 to 6.5. Within this range all essential nutrient elements will remain soluble and available for root uptake. To adjust pH, add pH Down (often required) or pH Up (rarely required). Add little by little until the pH falls within the correct range. To measure pH use a digital pH meter that has been calibrated in pH Buffer 4.0 and pH Buffer 7.0 (essential for accuracy). Nutrient strength (EC): Test using a conductivity (EC, mS, cF) or TDS meter (see conversion chart). For seedlings or clones use 0.6 to 1.0mS. For vegetative phase use 1.3 to 2.0mS. For flower use 1.6 to 2.5mS (Use the lower levels during heatwaves or if plants are stressed). The ‘meter’ reading indicates the concentration of salt based solutions. Hence, a higher reading implies a higher concentration. Therefore, if your meter’s reading is too low, simply add more nutrient. Obviously if it is too high then add more water. TIP: Always stir the nutrient solution well before taking readings. For recirculating hydroponic systems only: As plants grow they simultaneously remove both water and nutrients from the nutrient solution. Ensure the water level is kept relatively constant. When this is done, the concentration (EC) will be relatively predictable. It will move up or down depending upon the size and growth rate of plants and the salinity of the top-up water. 5. Tepid solution. Use a nutrient thermometer to monitor the temperature of your nutrient solution. The ideal is 20 °C (68 °F). Too warm and you risk promoting root diseases or suffocating the root zone with low dissolved oxygen levels. Too cold and you will shock the roots and slow plant metabolism to a crawl. Your nutrient solution should feel sort of “silky” and tepid—neither warm or cold. For further information see section below – “Maintaining Plant Nutrient and Root-zone Temperature”. 6. Water thoroughly. When hand watering or top feeding, do so slowly, evenly and gradually. Aim for around twenty percent of the nutrient solution to run out of the bottom of the pots. Run-off helps to keep the root zone cleaner with less salt build-up. Dry patches from automated top-feeding: Water the surface of the medium at as many points as possible otherwise areas of the root-zone will risk being left un-watered. Devices such as water-rings or spray nozzles are a good alternative to single point drippers (Fig 2.1). 7. Check run-off. For run-to-waste coco coir or soil systems, periodically collect some of the run-off and check its EC. If it measures more than 0.5mS (500 µS or cF 5.0) above the EC of the input nutrient solution then consider flushing through with a milder solution (or even pure water) to help clear the root zone of excess salts. For example, if the nutrient solution has EC 1.7mS but your run-off measures 2.3mS (or more) then it is time to flush. 8. Hard Water Problems: Hard water is typically alkaline—and so are many nutrient additives! “Alkalinity” is what typically drives nutrient pH above and beyond 6.5. This is the point at which many trace elements (e.g. iron) begin to destabilise. FloraMax Ca-Mg-Fe will “protect” the nutrient if pH spikes within the range of 6.5 to 10. Plants consume oxygen via the roots for the process of ‘respiration’. Oxygen also aids in keeping the nutrient sterile by satisfying the oxygen demand of aerobic processes. For these 2 processes to occur, the oxygen must be dissolved in the nutrient solution. This is achieved via ‘aeration’. • Designing the hardware (for recirculating systems only) so that the nutrient splashes into the reservoir when it returns from the roots. In either case though, good ventilation must be provided for the space where the aeration occurs. Failure to achieve this will cause the air in that space to become depleted of oxygen. • An air stone and air pump can also be used. Air stones have the added advantage of promoting circulation of the nutrient solution to ensure uniformity. Make sure to locate the pump in a well ventilated area. To prevent disease ingress, the nutrient solution, medium and roots should be regularly sterilized. ‘Sterilizing agents’ must yield a ‘residual’ chemical when dissolved in the working nutrient solution so that the entire system is treated each time plants are watered. Historically, chlorine dioxide, sodium hypochlorite, hydrogen peroxide and monochloramine are used for this purpose. However, monochloramine has the advantage of possessing a long half-life, is gentle on roots, and is compatible with the majority of ‘organic’ mediums and growth promotants. The growth of algae, slimes and pathogens is accelerated in nutrient solutions that are exposed to light. Further, chelated trace elements (and many organic additives!) can decompose when exposed to UV light. This causes them to become unavailable for root up-take. Light exposure can be minimized by placing a lid on the nutrient reservoir. Also, cover other regions of the system where nutrient is exposed to direct light. For example, the stem base and the top of open trays and channels. 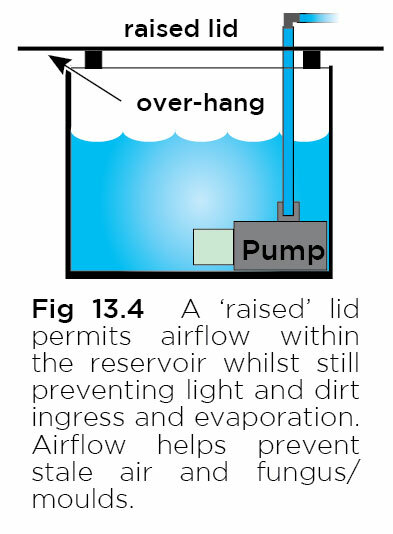 When placing a lid on the reservoir, have it in a raised position so that air can freely enter and exit (Fig 13.4). The nutrient solution and root zone should be maintained between 20-25 deg C (68-77 deg F). This range offers the best compromise for growth and other factors. As a general rule, growth is hindered significantly when this temperature is lower than ~20 deg C (68 deg F) or above ~35 deg C (95 deg F). Although temperatures ranging from 30-35 deg C (86-95 deg F) produce optimum growth in some species, fungal diseases generally become more common. Inadequate dissolved oxygen levels are also a potential threat, particularly if the nutrient is not well aerated. Given that the optimum air temperature is also 20-25 deg C (68-77 deg F), the temperature of both the nutrient and root zone can be optimized simply by controlling the air temperature to within that range. This is especially the case if the root zone occupies a large surface area and is poorly insulated, such as in NFT channels. These features of NFT complicate attempting to set the two temperatures widely different from each other. If additional heating of the nutrient solution is required, submersible water heaters are commonly used (Fig 13.5). Where cooling is needed, water-chillers are effective. For smaller reservoirs, some growers even utilize frozen water bottles. Positioning the nutrient reservoir in a significantly different temperature zone outside of the growing environment may help alleviate the need, or cost, of providing additional heating/cooling in some situations. In extreme climates, extra insulation can be gained by burying reservoirs underground. For more see page 45 of the FloraMax Hydroponics Manual.